By Bangladesh Media, Two alleged extremists were killed in gunfights with the police in Kushtia and Chuadanga early Sunday. Md Asaduzzaman, officer-in-charge of Kushtia Police Station, said 35-year old Alamgir Mandal was a member of Gana Mukti Fouz. He told bdnews24.com that a joint team of intelligence police and sadr police went to Darbeshpur village under Alampur union in the early hours of Sunday on being tipped off that a group of extremists were gathering there. Sensing police presence the criminals opened fire on the police and the law enforcers retaliated, Asad said. At one stage, in the exchange of fire, the men fled the scene. The police found Alamgir's body and recovered one gun, five home-made bombs, three machetes and five rounds of ammunition, he said. 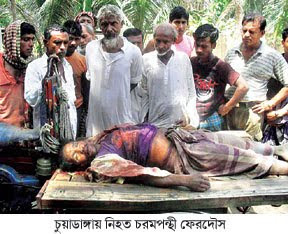 "The body was sent to Kushtia general hospital for autopsy." Alamgir has seven cases against him, including four for murder, the official added. In Chuadanga, an alleged extremist was shot dead by the police, when he threw a bomb at a patrol police car, police superintendent Nazrul Islam told bdnews24.com. He said the deceased, Ferdous Ali, 35, along with several members, were hanging around near Kaliabokri beel when the patrol car came upon them early Sunday. The police fired at them after being hit by a bomb, the official said. A loaded revolver was recovered beside the body, he added. Ferdous has four murder cases lodged against him.